Years ago, a few weeks before Christmas, a colleague sent me a story about Santa and a soldier sitting alone. At least that’s the way I remembered it. There was no attribution on the e-mail and I never knew its source, which made it hard to find after I lost track of the original post. This year I thought of it again, as I have every year since I first received it. 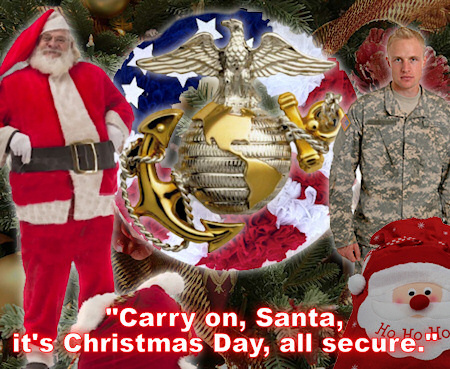 I checked the internet once more and was pleasantly surprised to find it on Snopes.com (www.snopes.com/holidays/christmas/soldier.asp), this time with attribution. I remembered a story but it was actually a poem written by former Marine Corporal James M. Schmidt in 1986 and was originally published in the Marine Corps magazine, Leatherneck. The poem has been distributed in different forms since then, sometimes modifying it to honor other services. I think the message is as powerful today as when it was written. At this time of year it seems especially appropriate to remember our troops, whether they are serving far from home, have completed their service and retired with our thanks, or lost their lives through their service. The world can be a dangerous place. They risk their lives trying to make it safer for us and deserve our thanks. Without further ado, I offer you Corporal James Schmidt’s fine poem. I hope it touches you, as it did me all those years ago.